I have two 45 caliber pistols that just don't like 200gr SWC rounds. One is a brand new S&W 625, the other is my old ball gun with a Kart barrel. They are accurate with jacketed bullets, but the SWC's open up to a shotgun pattern. 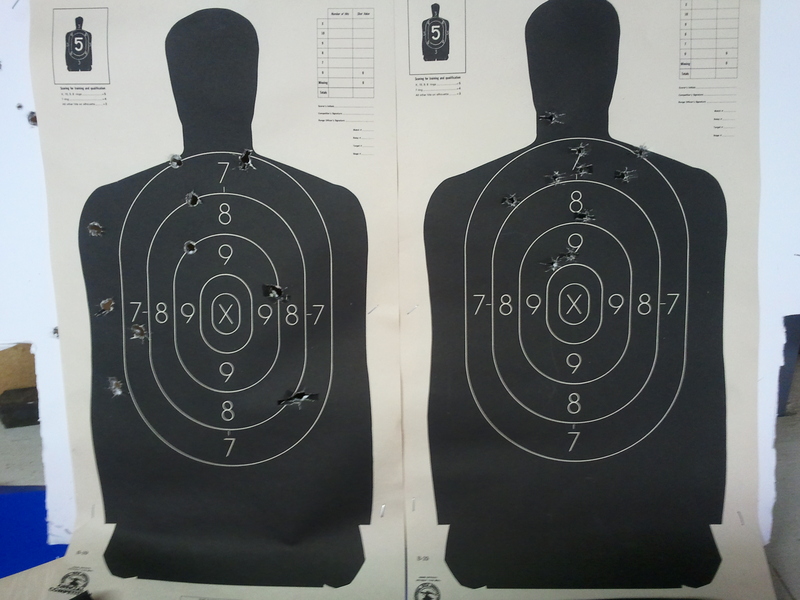 The following targets were shot with the revolver, but I get the same results with the 1911. The left target is the 200 SWC's, and the right target is 230 FMJ. 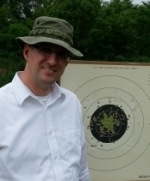 The target was shot at 50', but I get similar results at 25 and 50 yards. I think the SWC's are undersized for the barrels in both pistols. The issue I have is my one wad gun shoots these same loads with almost X ring accuracy. Do I slug the barrels to find out if there is a difference dimension wise? It almost sounds like I could end up needing two different SWC bullets, which would greatly complicate things. Or, do I just start using a round like the 185 JHP so it doesn't matter what gun I run it through? Of course there is no guarantee that one load is going to shoot through three or four different pistols, but It appears that the 200 SWC's are a no-go in both these guns. Ideas? My first Kart barrel on my wad gun had the same tendencies, but not nearly as bad as you'rs exhibits. After running 30K rds through it to try to find the magic lead swc load, and learning to shoot bullseye, I rebarreled it to another Kart bbl that did much better. The second wad gun I had built with a Kart also does quite well with lead swc. As many of our gunsmithing GURU's are at Canton & Perry, I'll throw my .02 worth in on the 625. I'd check the diameters of the forcing cone compared to the diameters of the cylinder chambers. On revolvers, I'm only passing on what I remember reading, as I've never worked on wheelguns. The 625 has a much better reputation for accuracy than what you're showing. Hopefully Jerry Keefer will see your post and chime in. He forgets more about wheelgun smithing while sleeping than I'll ever know. as stated, measure your cylinder throats. They must be larger than your barrel diameter, and the bullet must be at, or larger, that the cylinder throat. I have a different angle. Tell me all about your 200gr lswc ammo. Maybe it's a problem with your load. I cast my own and shoot H&G 130's(SWC) almost exclusively. All of my 45's digest and place these pills where they are intended so I would have to guess there is a problem with one or more of your components and the recipes you are stuffing up. Bullet size is critical with cast. Powder selection for cast will likely be different than what you find best for jacketed. I would suggest trying a different supplier or size of cast SWC. Do some research on a load for the 625. About 15 years ago there was a shooter that broke 2650 with revolvers. An article was done on his accomplishment. His .45 was a model 25 in .45 ACP.. I can't remember what he needed to do but it was not your typical 200 gn. SWC. Seems like it was a cast bullet intended for the .45 Colt in a .45 ACP. Also seems that he needed .45 Auto rim over moon clips for proper headspace. I know the diameter of the forcing cone is critical for revolvers. If the forcing cones are small they swage down the bullet before it ever gets to the bore. Forcing cones are usually small in anticapation of shooting jacketed bullets.The bullet fit to barrel is critical. I would slug both barrels and use a .001 to .002 larger bullet. I did have a Kart barrel that did not deliver acceptable accuracy and had to change it out. The 200 gn. bullet usually shoots and functions better than the 185. Marty Magnan of Leominster, Massachusetts, was the first to break 2,600 with a revolver in the National Championships at Camp Perry. click it for the full story.. Rob Kovach wrote: Tell me all about your 200gr lswc ammo...Maybe it's a problem with your load. I'm with Rob here - I'd like to know more about the load before looking at the equipment.